Screening more than 100 spider toxins, Yale researchers identified a protein from the venom of the Peruvian green velvet tarantula that blunts activity in pain-transmitting neurons. The findings, reported in the March 3 issue of the journal Current Biology, show the new screening method used by the scientists has the potential to search millions of different spider toxins for safe pain-killing drugs and therapies. 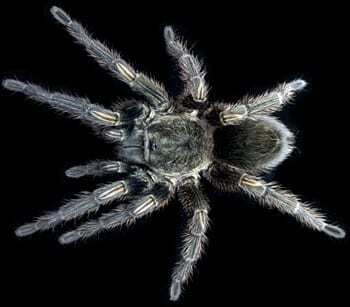 The researchers note that they tested the spider toxins on only one of a dozen suspected human pain channels. “The likelihood is that within the vast diversity of spider toxins we will find others that are active against other channels important for pain,” said Michael Nitabach, associate professor of cellular and molecular physiology and of genetics, and senior author of the paper. The researchers screened the toxins from a variety of tarantula species to find one that blocked TRPA1, an ion channel on the surface of pain-sensing neurons that is implicated in inflammation and neuropathic pain. In a process dubbed toxineering by the Yale researchers, the team generated another small library of mutated versions of the tarantula toxin to find one that blocked TRPA1 but had no effect on activity of other channels on the surface of neurons. “The beauty of the system is we can also screen engineered toxins not found in nature, and identify higher-potency and more specific molecular variants that lack deleterious effects on essential nerve functions,’’ Nitabach said. April 17, 2019 - Barrage repairs at Okhla park force birds out in breeding season Down To Earth MagazineIrrigation officials dried up the wetland for 15 days for the task, but ecologists claim the repairs are not needed every year. April 7, 2019 - Roads Traveled: Pick your poison at new Milwaukee Public Museum exhibit Kenosha NewsWatch the movie “Alice in Wonderland” sometime and pay attention to the crazed guy at that tea party. The edgy one who's rude, hyper and wears a high-top hat. April 17, 2019 - Anti-Venom Market Product Type, Applications, Advanced Technologies, Recent Trends and Regional Analysis 2019-2023 Industry HeraldIt is estimated that the Anti-Venom market is expected to grow at a CAGR 6.5% during the forecast period of 2017–2023. Market Outlook 2019 to 2023.